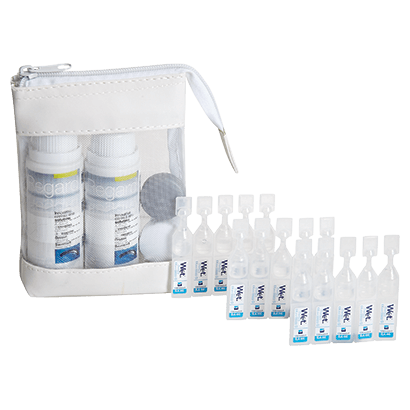 Pack size: 2 x 60ml solution bottles, 15 x 0.4ml wet therapy vials, 1 contact lens case & 1 travel zip bag. Review Regard Luxury Soft Lens Travel Bag Good to use on flights, compact little package. Review Regard Luxury Soft Lens Travel Bag Great service and this was a very useful little travel bag for contact lenses! Regard Luxury Soft Lens Travel Bag I have discovered this bag when i decided to only take hand luggage on my flight with me. You can't take a usual big solution bottle with you and as I use Regard, I figured this might be the best option. Not disappointed at all. Regard Luxury Soft Lens Travel Bag This is by far my favorite travel set for solutions on the market! The Regard Luxury Soft Lens Travel Bag is an ideal accessory for contact lens wearers embarking on a short haul flight. Created by Advanced Eyecare Research, the Regard brand is well known as an optimal source of comfort and technical precision for contact lens wearers. The pack consists of two 60ml bottles of Regard contact lens cleaning solution, 15 x 0.4ml wet therapy vials and the lightweight case itself. The Regard Luxury Soft Lens Travel Bag is dedicated to convenient forms of lightweight travel. Doing away with the need to bring along a regular large size solution, the case is sensible way to travel.